Hello Friends! You know for a 'one-year-old', I really feel pretty mature. I mean, with this BLOG one year old (lol), and here I am WRITING at twelve months, reading, telling awful jokes...heck...I am even potty-trained! Thanks so much for stopping by. As always, remember to do your own investigation on all stocks discussed on this blog and consult liberally with your investment advisors...as I am an AMATEUR investor who just likes to discuss ideas and look at stocks. If you have any questions, comments, or words of encouragement, please feel free to post them right here....just click under the posts where it says "comments" and start a discussion...or email me at bobsadviceforstocks@lycos.com and I will probably respond to you right in the blog! Was looking over the big movers today and came across MapInfor Corp. (MAPS). MapInfo is having a fairly nice day today trading at $10.50, up $.56 or 5.63% as I write. According to Yahoo.com, MapInfo "...is a global software company that designs, develops, licenses, markets and supports location-based software and data products, application development tools and industry-focused solutions." I guess the key to all of that 'jargon' is the term "location-based". Sort of like a map! On April 21, 2004, MAPS announced 2nd quarter 2004 results: revenue came in at $31.4 million vs $27.1 million in the prior year same quarter. Net income came in at $1.07 million vs a loss of $(742) thousand last year. On a per share basis, this was $.07/share vs $(.04)/share last year. If we look at Morningstar.com "5-Yr Restated" financials, we can see a slightly erratic growth in revenue from $74.4 million in 1999 to $114.0 million in the trailing twelve months. Earnings peaked in 2000 at $.54/share dropping to a loss of $(.16)/share in 2002 and have been improving each year since. Free cash flow which was $(1) million in 2001, $(7) million in 2002, turned positive in 2003 at $3 million and has improved to $6 million in the trailing twelve months. The balance sheet on Morningstar.com shows $35.4 million in cash and $27.8 million in other current assets, easily covering the $41.5 million in current liabilities, with enough left over to pay off the long-term liabilities of $17 million if that were necessary or desirable. Looking at "Key Statistics" from Yahoo, we see that this is a SMALL cap stock with a market cap of $206.46 million. The trailing p/e is steep at 50.10 (as the company is just returning to profitability), but the growth is so FAST that the forward p/e (fye 30-Sep-05) is only 21.04. Thus the PEG, which isn't cheap, isn't nearly that bad at 2.21. The price/sales is 1.65. Yahoo reports 19.62 million shares outstanding with 19.60 million of them that float. Thus, the insider holdings are only 0.13%. There are only 180,000 shares out short representing 0.92% of the float or only 0.677 trading days as of 4/7/04, so this is not much of an issue. No cash or stock dividends are reported on Yahoo. We can see that MAPS was trading lower throughout 2002, bottoming out in January, 2003, at about $3/share, Since that time, it has moved higher, breaking through a resistance level at about $12 in August, 2003, to its current level around $10. By the way, I do NOT own any shares nor have any leveraged position on this issue. What do I think? I prefer stocks a little higher than $10.50/share. With an 8% stop, I seem to hit this point over and over in the lower-priced investments. Other than that, I like this stock! The valuations isn't bad, the technicals look nice, and the recent earnings report is encouraging. P.S., meanwhile, enjoy a slice of birthday cake: a beautiful picture from one of my favorite artists: Wayne Thiebaud! in my humble opinion, this 1890 level appears to be a critical area that may determine whether more selling will develop. I do not claim to be a brilliant technician, but what do you think? It looks like if this level holds, this would represent some sort of "double bottom" and we may see some upside from here. Otherwise, look out below! looks like it has broken through the prior support level, so I am not sure what to make of it except where is the next level of support? I don't make many technical observations, so if there are better technicians out there, just email me at bobsadviceforstocks@lycos.com, and we can share your comments with everyone! "Happy Birthday Stock Picks Bobs Advice"
Hello Friends! It is hard to believe it but tomorrow marks ONE YEAR of blogging for me! If you have any birthday greeting, comments, or words of encouragement, please email me at bobsadviceforstocks@lycos.com and I will share them with the rest of the blognerhood. (Is that a WORD???). Anyhow, Again THANKS for stopping by and I look forward to another year of blogging and posting out here in cyberspace! Hello Friends! As always, I am greatly appreciative of your visit here today. Remember to always do your own investigation of any stock discussed on this website and please consult with your investment advisors to determine whether investments are appropriate and timely for you! 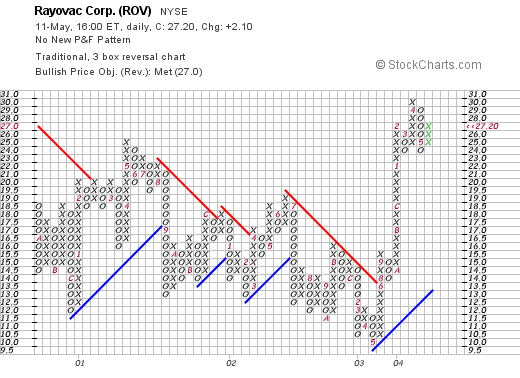 Rayovac (ROV) made the lists today for one of the top performers on the NYSE. This stock is not a "perfect" fit on this blog, but I like it better than most of the others on the gainers list today. ROV closed today at $27.20, up $2.10 or 8.37% on the day in a market that rebounded from the past week's correction. According to Yahoo, Rayovac "...is a global branded consumer products company with market positions in two product categories: consumer batteries and electric personal care products." On April 22, 2004, Rayovac announced 2nd quarter 2004 results. Second quarter net sales were $278 million, up from $202.3 million the prior year. Sales were positively impacted by the acquisition of the Remington acquisition. Net income for the quarter ended March 28, 2004, came in at $2.6 million compared to $300,000 the prior year. (Pro forma net income came in at $6.7 million vs. last year's $4.5 million). Pro format earnings per share came in at $.19/share, a 36% increase over $.14/share the prior year. This is a more accurate result than the reported eps of $.08/share vs $.01/share the prior year. Pro forma, as I understand it, takes into consideration acquisitions in comparing results to give a more realistic review of the results. In either case, earnings and revenue were up nicely! If we look at a "5-Yr Restated" financials from Morningstar.com, we can see what appears to be fairly flat revenue performance between 1999 and 2002, and then substantial growth in revenue in 2003 and in the trailing twelve months. Earnings/share have also been erratic but have improved nicely the last 18-24 months. Free cash flow, per Morningstar, was $(2) million in 2001, improved to $51 million in 2002, $50 million in 2003, and $73 million in the trailing twelve months. The balance sheet shows $25.6 million in cash and $609.7 million in other current assets, enough to easily cover the $392.4 million in current liabilities and to pay off some of the $917.3 million in long-term liabilities. Looking at "Key Statistics" from Yahoo.com, we can see that the company is a "mid-cap" corporation with a market cap of $926.89 million. The trailing p/e is nice at 22.30, but the forward p/e (fye 30-Sep-05) is even nicer at 12.95. The PEG is beautiful at 1.06, with a price/sales VERY reasonable at 0.72. There are 34.08 million shares outstanding with 29.60 million of them that float. Interestingly, there are 2.64 million shares out short as of 4/7/04, representing 8.93% of the float or 5.723 trading days. This is a large short balance, in my opinion, whenever the days short exceeds 3 or 4. We may be witnessing a bit of a short "squeeze" in here! Yahoo reports NO cash dividend and no recent stock split. , it appears that the stock price which has been heading "sideways" or lower since mid-2000, broke through a resistance level on an upwards move in June, 2003, at a bout $14 and has been heading higher since! It looks nice to me imho. What do I think? I kind of like this battery and shaver company. I do not own any shares or options, but IF I were in the market to buy some shares, this one might be on my short list. The recent growth in revenues and earnings demonstrates the capability of this management team to integrate acquisitions in a positive fashion (I believe that the term used is that the acquisitions have been "accretive" to earnings!). I like the PEG at just over 1.0. The Price/sales UNDER 1.0 is nice. And the large short interest is an interesting plus. I only wish they paid a dividend (LOL) or that their revenue growth record was a bit longer than just the past couple of years. Hello Friends! O.K. it is another LOUSY day in the market. But what can I say about that? My stocks in my trading account are doing lousy. I had to send over some cash from my savings as the margin was getting a bit borderline and I didn't want a forced sale....that should teach me. 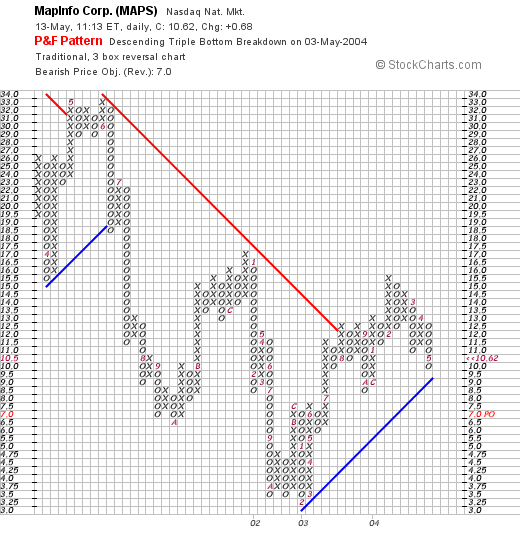 But none of our stocks have yet hit a sell point...so I will hang in there. And I am also SORRY about not posting a retrospective review this weekend. Boy am I ever apologizing today! It is interesting that Hewitt Associates (HEW) made the list earlier today with a gain of $.61 or 2.06% at $30.26 as I write. But the numbers look nice so here goes! According to Yahoo, HEW "...is a global provider of human resources outsourcing and consulting services." I do not own any shares nor do I have any leveraged positions. On May 4, 2004, HEW announced Second Quarter 2004 results. For the second quarter ended March 31, 2004, revenue was up 14% to $546.3 million from $478.1 million last year. Net income came in at $30.4 million or $.31/diluted share, vs $23.5 million or $.24/diluted share the prior year, for an increase of 29%. If we look at the "5-Yr Restated" financials on Morningstar.com, we can see that revenue has grown steadily from $1.1 billion in 1999 to $2.1 billion in the trailing twelve months. Earnings have increased from $.97/share in 2003 to $1.12 in the trailing twelve months. Free cash flow has been solid, with HEW generating $261 million in 2001, $192 million in 2002, $235 million in 2003, and $211 million in the trailing twelve months. Looking at the balance sheet on Morningstar.com, HEW reports $250.7 million in cash and $529.8 million in other current assets, easily covering the $455.8 million in current liabilities and making a "dent" in the $454.1 million in long-term liabilities if needed. How about valuation? Looking at "Key Statistics" from Yahoo, we can see that the market cap of HEW is $2.98 billion. The trailing p/e is 25.57 with a forward (fy3 30-Sep-05) p/e of 19.73. The PEG isn't too bad at 1.44, and the price/sales is nice at 1.35. Yahoo reports 98.24 million shares outstanding with 38.40 million of them that float. Currently there are only 192,000 shares out short representing only 0.50% of the float or 1.466 trading days...so this does not appear to be an issue. 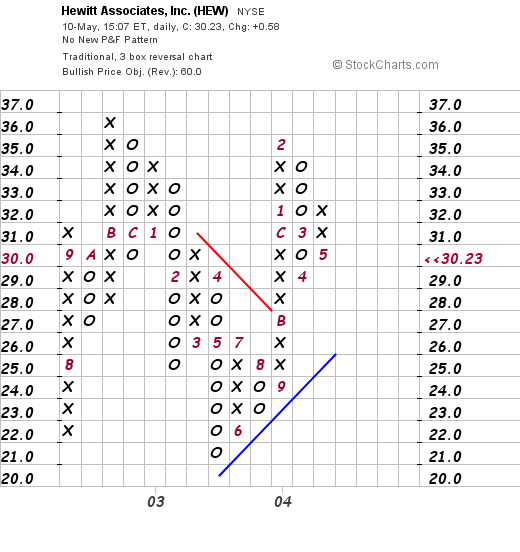 Yahoo does not show any dividend on this stock, nor any recent stock split. Looking at a point & figure graph on HEW: we can see that HEW has been trading recently above its support level but longer-term mostly moving in a rather horizontal fashion (how is that for a 'sophisticated' technical analysis...lol)....moving sideways...but NOT looking overextended to me! 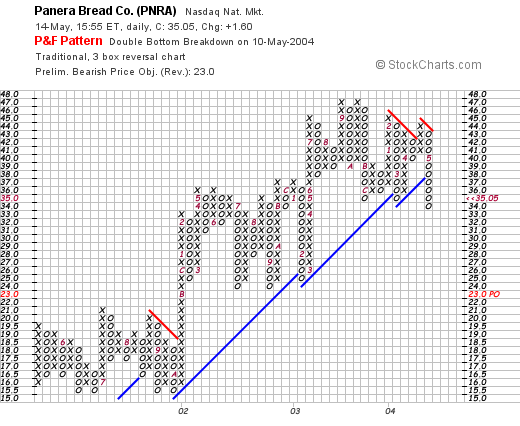 Overall, this is a nice selection in a company that is not overvalued, has steady growth, and reasonable technicals. No dividend though...if that is important! Hello Friends! Thanks so much for stopping by! I am so glad it is Friday, it is sunny outside, and not too hot. A beautiful day in Wisconsin! I hope you are having nice weather also. As always, I must insist that you do your own investigation on all stocks discussed on this blog before making any decisions, and please discuss this with your investment advisors as I am an amateur investor and cannot be expected to advise you regarding the suitability and profitability of any investment idea! And THAT was a LOT of exclamation marks!!! On May 4, 2004, PRVD announced record third quarter 2004 results. Net sales increased from $28.8 million in the quarter ended March 31, 2003, to $40.7 million in the same quarter this year. Net income, on a fully diluted basis, increased from $.22/share in 2003 to $.30/share this year, same quarter. If we take a look at the Morningsar.com "5-Yr Restated" financials we can see a rapid increase in revenue from $3.9 million in 1999 to $88.7 million in 2003. Net income has turned positive from negative and the free cash flow which was $(4) million in 2001, improved to $0 in 2002 and $7 million in 2003, with $6 million reported in the trailing twelve months. Balance sheet-wise, this company looks fine, in my humble opinion, with $6.5 million in cash and $2.1 million in other current assets with $7.7 million in current liabilities and NO long-term liabilities at all. Looking at "Key Statistics" from Yahoo we can see that this is a SMALL cap stock with a market cap of only $228.66 million. The trailing p/e is only 17.20, but the forward p/e is 32.87 (???). That part I just don't follow. As the PEG is only 1.30 and price/sales at 1.87. Probably some kind of error that forward p/e...(?). Yahoo reports 11.40 million shares outstanding with 4.30 million of them that float. There are only 11,000 shares out short as of 4/7/04, representing 0.5 trading days or just 0.26% of the float...so this is not an issue. No dividend is reported and Yahoo does not report any stock dividend either recently. Taking a look at a chart: We really do not have much of a chart to hang our hats on but overall the stock price is appreciating, but currently under a resistance level. Maybe you can get a better take on this one. What do I think? The stock is interesting to me. The results and rapid revenue growth are impressive, the balance sheet is nice, and the valuation does not seem unreasonable. And it is ALMOST Mother's Day. So Happy Mother's Day all you MOMS out there! Hello Friends! It is NOT a very pretty day on the street today. For the record, as I write, the DJIA is trading at 10,220.82, down 90.13 points (0.87%), and the NASDAQ is trading at 1,931.76, down 25.50 points (1.30%). Nothing much to write home about I guess unless you are short the market. Diebold (DBD) is having a nice day today. It is interesting that the latest news on Diebold has been marginal at best in the "media" with stories running about problems with their voting machines in California. However, their business is otherwise doing just fine, and hopefully they will get the bugs out of the electronic machines and still get the business without any lawsuits, etc. This is certainly a potential risk for this firm. As I am writing, DBD is trading at $46.95, up $1.26 on the day or 2.76%. On April 20, 2004, Diebold announced first quarter 2004 results. Revenue grew 21.5% to $498.3 million, diluted earnings per share grew 11.1% to $.40/share compared to $.36/share in the first quarter of 2003. Taking a look at "5-Yr Restated" financials on Morningstar.com, we can see that revenues have grown steadily from $1.3 billion in 1999 to $2.1 billion in the trailing twelve months. Earnings, however, have been a bit erratic, with $1.85 reported in 1999, climbing to $1.92 in 2000, dropping to $.93 in 2001 and then climbing steadily since then to $2.40 in the trailing twelve months. DBD has also raised its dividend each year from $.60/share in 1999 to $.68 in the trailing twelve months. Free cash flow has also been solid, increasing from $86 million in 2001 to $137 million in 2003. The balance sheet is also very clean with $176.1 million in cash and $929.1 million in other current assets, more than enough to cover both the current liabilities of $618.7 million and the long-term liabilities of $133.6 million. What about valuation? If we take a look at "Key Statistics" on Yahoo.com, we can see that DBD has a market cap of $3.42 Billion, a trailing p/e of 19.28 and a forward p/e of 15.44. These numbers are not overly inflated especially in light of latest quarterly results. 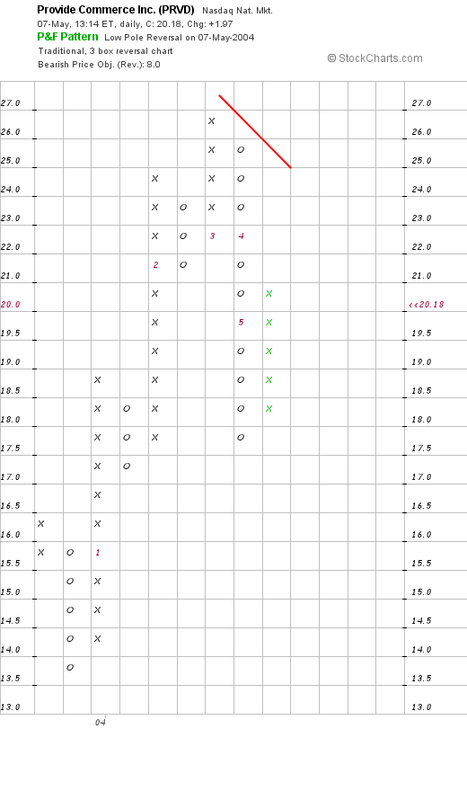 However, the PEG at 1.74 is under 2.0, but I would prefer to see it closer to 1.00 to say that the stock is cheap. Price/sales also at 1.52 isn't bad but not actually cheap. Yahoo reports 72.91 million shares outstanding with 71.30 million of them that float. There are 1.65 million shares out short, which is pretty high at 2.31% of the float or 3.233 trading days...as of 4/7/04...and is up from the prior month's level of 1.19 million shares out short. Is suspect that a lot of investors are betting on the voting machine problems becoming a true fiasco! The company does pay a small dividend of $.74/share yielding 1.62%, and the latest stock split reported on Yahoo was a 3:2 split in February, 1997. What about technicals? 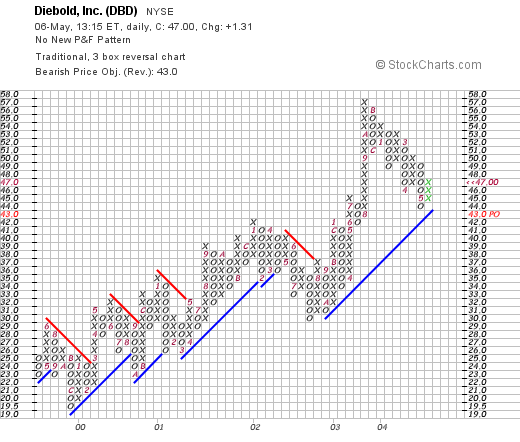 Taking a look at a recent "Point and Figure Chart" on DBD: we can see that the company is still trading above its support level and unlike some of the stocks we have looked at, really appears not to be over-extended...at least in my humble opinion! Where does that leave us? I guess the big question on this stock is the voting machine question. However, this is a company that is big in ATM's and likely will benefit from a large voting machine business in the future as the quirks get figured out. Meanwhile, the valuation isn't bad, the earnings are nice, and the company even pays a dividend! I do not own any shares or have any leveraged positions in this issue. As always, please discuss this and all stock market investment ideas with your investment advisors and do your own investigation as I am an amateur investor!